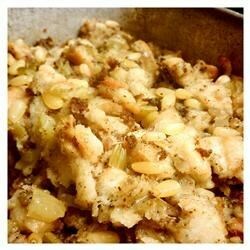 "This is the best Thanksgiving stuffing I have ever had. With a mix of Southern-style cooking and Italian flavors it brings all great tastes together. I got this recipe from my mom last year after everyone gave it amazing reviews!" Preheat an oven to 375 degrees F (190 degrees C). Grease a deep 9x13 inch baking dish or roasting pan. Heat a large skillet over medium-high heat and stir in the sausage. Cook and stir until the sausage is crumbly, evenly browned, and no longer pink. Drain and discard any excess grease. Place the browned sausage into a large mixing bowl. Meanwhile, heat the olive oil and pancetta in a large skillet over medium heat. Once the pancetta begins to brown, stir in the onions and celery, and cook until the onion softens and turns translucent, about 8 minutes. Stir in the garlic, and cook another 3 minutes until the aroma of the garlic mellows. Scrape the onion mixture into the bowl with the crumbled sausage. Add the French bread, cornbread, dried sage, poultry seasoning, salt, and pine nuts; stir well. Pour in the chicken broth and mozzarella cheese; stir until the chicken stock has been absorbed by the bread and the stuffing is evenly mixed. Pack the stuffing into the prepared baking dish, and dot the butter overtop. Cover with aluminum foil. Bake in the preheated oven for 45 minutes, then remove the foil, and continue baking until the top has turned golden brown, about 15 minutes more. Sprinkle with the fresh sage and shaved Parmesan cheese to serve. Sorry to leave a poor review. This was far to spicy and greasy for us. Yes I cut down the spices to 1/3 of the recipe and drained the sausage. I made with recipe several years ago and since then it has been requested yearly. Now one of the new faves on the Thanksgiving table. My Neice made this today for the first time and it is awesome! I couldn't wait to get home and print this recipe.